Breakfast casseroles are delicious, but too few offer vegetarian options that are hearty enough to stand up to the bacon and sausage-laden classic breakfast dishes. Well, not this one. Vegetarian breakfast casseroles often go extra-light, with fresh green vegetables or a smattering of herbs in the eggs. This is a hearty vegetarian breakfast casserole recipe with all the rich, deep flavor you'd usually get from meat, but even better. Then there are sun-dried tomatoes, preferably really good ones packed in oil (perhaps with some herbs) to give umami flavor and a little bit of meaty chew here and there. The cheddar adds great flavor to the mix, too. If you're feeling fancy, throw in a few leaves of rosemary or thyme, but it doesn't need it. This dish is truly hearty; it's packed with more potatoes than I usually put in a casserole of this size. But the texture is still light and even fluffy, thanks to the shredded potatoes, which don't weigh this down like cubed potatoes can. It's a great make-ahead breakfast. Make a pan of this and serve for brunch -- or just to take a wedge with you to the office every morning for a few days. Lightly grease a 9- by 13-inch baking dish with nonstick spray or olive oil. In a large skillet, heat the butter over medium heat until it melts and foams up. Add the onion and garlic and cook for 5 minutes, or until the onion has softened. Add the sun-dried tomatoes and cook for about 5 minutes or they are fragrant and the onion is nearly translucent and beginning to brown around the edges. Turn off the heat. Bake at 350 F for 35 to 45 minutes, or until the eggs are firm and the top is slightly golden. Serve immediately with a fresh salad or fruit. 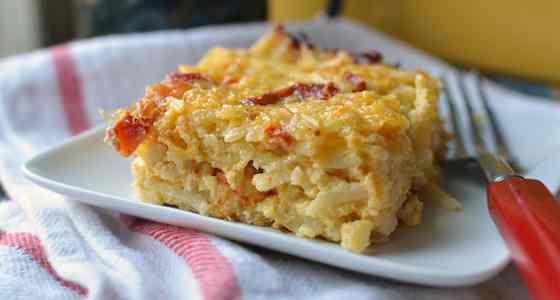 Article: Copyright © Tribune Media Services Inc.
"Cheesy Potato Breakfast Casserole with Cheddar and Sun-Dried Tomatoes"